This recipe leaves out baking soda for a sweeter taste. If the candy gets too hard, leave it in a sealed container for a week to get a delicate, brittle quality. Prepare a baking sheet lined with parchment paper or a silicone mat. Add the peanuts, sugar, corn syrup and water to a heavy bottomed pot and heat over medium-high heat. Heat, stirring constantly until the sugar and peanuts are a caramel brown. Remove the pot from the heat and add the butter and vanilla extract, stirring until the butter is fully incorporated. Pour the mixture onto the prepared baking sheet, and spread it out so there are no mounds of peanuts. Let this cool completely and then sprinkle with the salt. 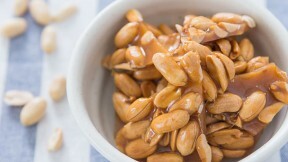 Break up the peanut brittle, and store it in an airtight container.